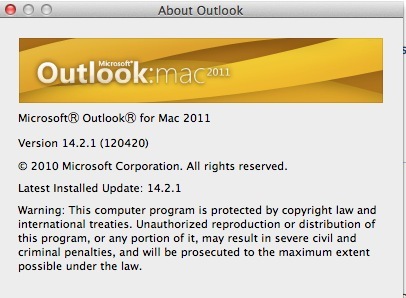 99.9% of the time that I install yet another Microsoft update I really don’t see or notice any change or improvement, because they are just security updates however yesterday my Outlook for Mac 2011 was updated and it actually solved a big issue for me. I have multiple email accounts and use Outlook to manage all of them, and I receive many emails every day that I just need to quickly read then delete. After a while I have thousands of emails in my deleted folder. When I would want to permanently remove these deleted emails I would find the folder, then choose Delete. Outlook would start to delete them then crash after deleting only a dozen or so messages. Not friendly. After the latest update I can now permanently delete hundreds or thousands of email from my Deleted Items without a crash. Thank you Microsoft for fixing a bug in Outlook that helps me.